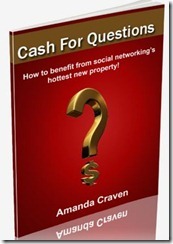 Cash For Questions is a comprehensive 45 page, step by step guide to profiting from an unexploited social media platform that is set to explode! If you could discover a site so under the radar that up until now it’s been the preserve of true leaders in their fields along with a VERY FEW lucky underground marketers, all making a killing by simply asking and answering questions the RIGHT WAY, would you jump at the chance to join them? Get your hands on this brand new tell-all report now!